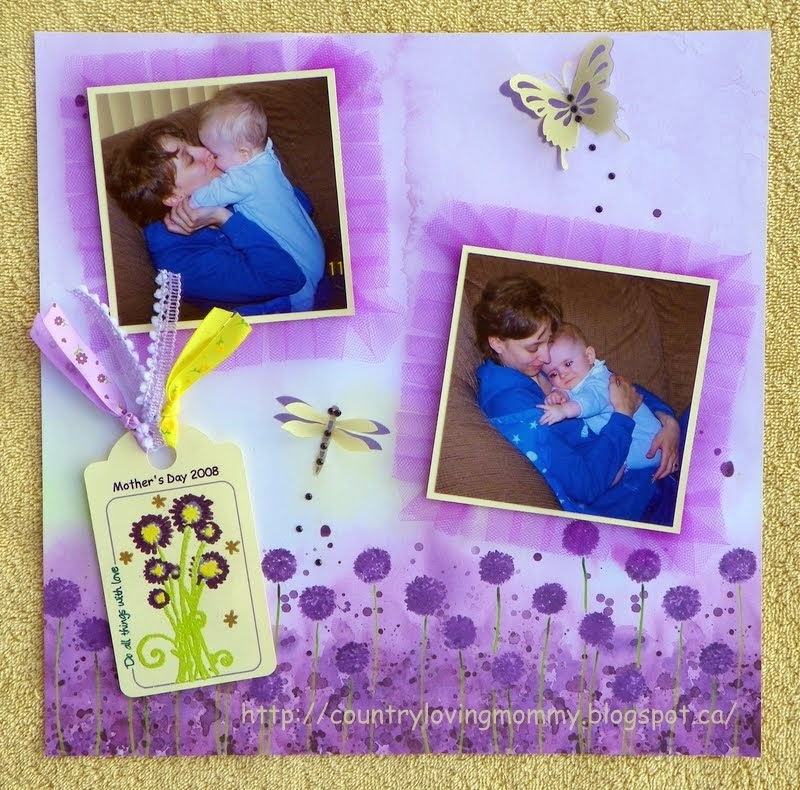 Our second challenge at Crafting With Dragonflies this fortnight is to create a scrapbook page with the theme of Mothers. We have our wonderful sponsor, Bugaboo Stamps, which offer the winner 7 digis of their choice. Just a gentle reminder to be eligible for the prize and top 3; no backlinking, follow the theme, and be a follower of the challenge blog. I look forward to seeing your creations! And I so loved my teamies cute and sentimental pages too. I used a 12x12 dp I bought at Michael's. My tag was a Silhouette file that I used print and cut to put my Bugaboo image Love Blocks - with love on. I then heat embossed my image. I have never done that before and still have a ways to go before I am comfortable with it. I asked The Husband if I should redo my tag and he said, "I thought you were going for folksy". Well I am now, folksy it is ;o) I tied 3 different ribbons through the top. My butterfly and dragonfly are also Silhouette files cut out of yellow and purple vellum and then embellished with Jolee's Jewels hotfix Swarovski crystals. To frame my pictures I used purple tulle that I hand pleated. Not the easiest to get a straight edge and a little tricky at the corners but I like the idea. 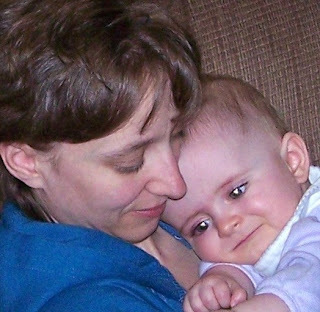 These pictures are of my oldest daughter Kaylee and myself in 2008. Kaylee was about 8 months old. I am a chronological scrapbooker and am scrapping 2006 right now (don't say it, I know) so now I can say I am 1 ahead on 2008, lol. The most remarkable thing I noticed when scrapping these pictures, and it truly is a God winks moment as my Mom would say, is that the reflection in Kaylee's eyes is heart shaped. I told her it was because we were cuddling. Works for me!